Over Memorial Day weekend, I went to YMCA Camp Jones Gulch Family Camp out under the California redwoods. I'm not much of a hiker, and I hate riding horses (the knees are just not flexible enough anymore), so I usually spend much of my weekend hanging out in the crafts area. The last few times I've gone to family camp, I've actually volunteered and run a tie-dye activity there, and I did it this time too. I have done large groups several times, but there are different dynamics depending on the group. When I work with my first graders, I'm working with a relatively homogeneous group. I have volunteer parent helpers and the teachers to keep things under control. It's pretty much a class project like any other, and the kids are expected to pay attention to the lecture and then do what they are supposed to. The kids get to make choices about how they want to fold their own shirt (which of three folding patterns) and what colors they want to use, but they all work pretty much in lockstep. They all fold at the same time, and they all dye at the same time (a class at a time, 5 classes). The results are uniformly decent-to-very-good (and you can tell what pattern they were trying to make), since everyone gets help. The kids love it, especially since they get to keep the finished shirts. When I tie-dye at family camp, things are quite different. The group is more diverse in age and ability (kids of all ages, with or without their parents there, a few grandparents). The tying and dyeing are available all day Saturday, and people wander in when they want to, so sometimes it's a rush, and sometimes it's a trickle. I don't really know how many people are going to show up, since they might only come if they have time between other activities and aren't too tired. I think I had around a hundred people wander through, but I don't know for sure. 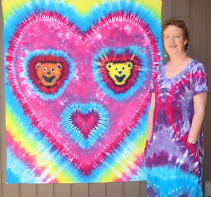 At family camp, I'm the only tie-dye "expert", and I have one or two counselors dedicated to working on this activity. We can't provide nearly as much help as we do for the first graders. Many people don't want help anyhow--they just want to do their own thing and go wild (such as the nine-or-ten-year-old boy who dyed his shirt by mopping up the puddles of dye left on the table by previous participants--in an example of how unfair the world is, his shirt came out quite nicely!). Many people are making things up as they go along. Some people achieve bold geometric patterns, while others go for random splotches of color. The results vary wildly. Group tie-dye is a very popular activity. In the first grade classes, it's a chance to make art, to make a mess, and to make a shirt of your own. At family camp, it's all of those things and more. The process can be a family bonding activity, and making matching shirts, bandanas, and so on helps bond families further when they all wear and show off the matching clothes. For some, it's a chance to relive fond memories of doing camp or school activities they did when they were kids themselves, or a chance to catch up on fun they missed when "everyone else was doing it".